Just because your move is completed does not mean the work ends! In fact, even for our full service moving customers there is a seemingly un-ending list of to-do’s that often follow a move. It is simply a large transition, requiring quite a bit of organization and work in order to get completely settled in to your new home! Even after the movers are finished, we understand that you have several days of work until life goes back to normal. You still need to unpack, rearrange furniture, clean, dispose of boxes, etc. and for many, your timeline isn’t very forgiving! Often kids need to get back to school, you need to get back to work and life in general simply isn’t slowing down. Let us help you out! Our moving professionals can come back out to your home or office and finish tying up all of the loose ends to get you all settled in. Unpacking boxes: Our experts will unpack any boxes, including fragile boxes, streamlining the process of unpacking. Opt to have us unpack only, or tell us which rooms to unpack in and where you would like items put away or stored. Box disposal and junk removal: Gather all box remnants and other discarded items and dispose of them. This also ensures that you aren’t throwing materials away where they don’t belong or clogging up your own garbage as soon as you move in. Moving Ahead strives to recycle all that we can during junk and garbage removal! 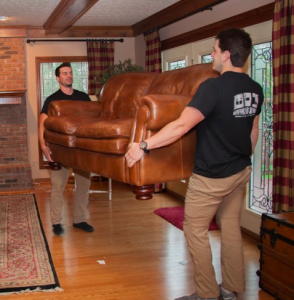 Furniture & appliance rearranging and organization: Following your instructions to move your furniture wherever you would like it placed within your home – including couches, chairs, beds, tables, entertainment centers, and more. Whether you aren’t physically strong enough to lift and move these items yourself or you simply want to conserve your time and energy, this is a useful service to take advantage of! Picture mounting & decorating: We will mount any pictures and artwork you have per your instruction. TV/ audio/computer hook-up: Hook up for any audio or computer devices, whether you are unsure of how to do so yourself or you just want an extra hand. This ensures that you will be able to use your devices immediately after your move! Reduce the stress during and after your move with Moving Ahead Services! Plan your custom post move services today, give us a call or get started online. Post move services follow your local or long distance relocation can be a great way to get settled in fast. Call us today!